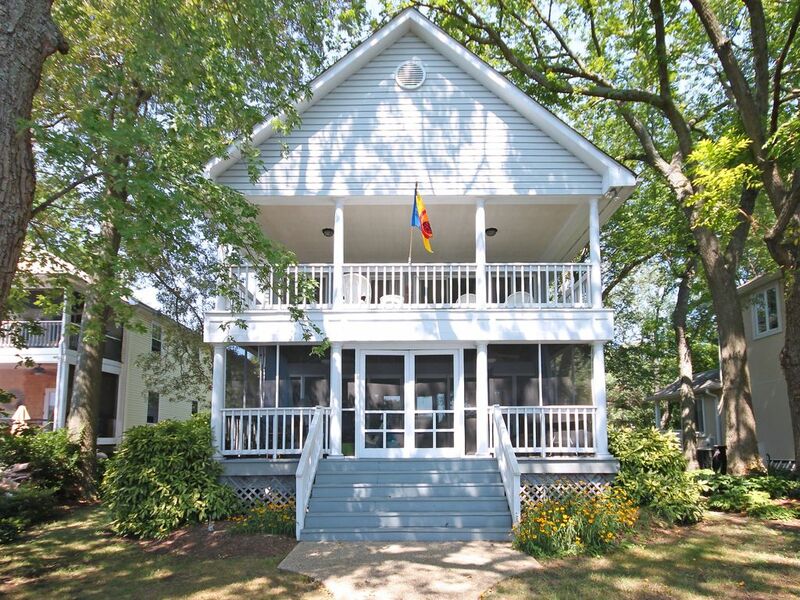 Gorgeous Annapolis Area Waterfront Home! Beautiful views of the river as you enter this 5 bedroom waterfront home. Imagine watching boats from the screened-in porch or your own dock. Or go for a swim or kayak ride. Dividing Creek is a beautiful river, so much so that you will typically see a boat or two that anchor overnight. This three level home has a light-filled and open floor plan, which has been recently updated for a clean and modern feel. The home has 5 bedrooms and 3.5 bathrooms, including one king, 2 queens, 2 sets of twins and a sleeper sofa. There is a large flat yard, perfect for family games, with beautiful landscaping. It is a 10 minute car ride to downtown Annapolis. Perfect for family retreats with multiple areas to gather including an upper and lower porch, a spacious basement for the kids with queen sofa bded, and a large living room. There are also 2 kayaks and 2 canoes for use! The property has been in our family since 1920. In 1991, the original "shore shack" was taken down and a new house was built. Table seats 8, with 3 more that can be seated at the kitchen bar. Outside table seats 10. We LOVED this house. It was comfortable, beautifully decorated, spacious and fully stocked. It was also very clean. Jean was fabulous to work with and very helpful and responsive. We will definitely rent again. Well appointed home on a beautiful part of the Magothy. We live in the area and had family staying here for a long weekend in February when we ran out of space. Would book again in the summertime when we can take advantage of the river. One of this year's late summer long weekends was the second season that a group of us who had been college roommates about 1000 years ago reunited at this most beautiful house and setting in Saverna Park. We were five, supposed to be six, and hope to be next year. Most of us are drawn to the water and so the dock, the kayaks, the swimming tubes and floats -- each and all contributed to a beautiful time on or beside the river. The house has so many different gathering places! Two porches and a comfortable, intimate living and dining area -- we used them all. The kitchen is exceptionally well stocked, and while we did a little food shopping en route, once we got to the house we never left! Except to kayak across the river to pick up some take-out food from The Point Crab House Bar and Grill. Thanks so much, Jean, for making your lovely home available. We hope to be back next year! Jean was absolutely wonderful and attentive. The house was laid out perfectly for a group, all the amenities were available, and I’ve never seen a more perfectly stocked kitchen (the private chef we had agreed). The water was fantastic for a nice dip, so many restaurants in the area, Joe’s Crab Shack was delicious, Vino301 wine tours picked us up from the house. Couldn’t have asked for a better house/location/hostess. Thank you Jean!! This house was absolutely amazing! Very clean and plenty of space for the multiple families! We couldn't have asked for a better place to stay! After our long hot days at the lacrosse field, our boys loved that they could jump into the river to cool off. Moms and dads also enjoyed taking out the kayaks and the canoe. You'd think the boys would be tired after 2-3 games, but they couldn't get enough of the river. It was so nice being able to sit on the porch and watch the sunrise. Had a chance to chat with the neighbors and their daughter who was visiting. Very nice and the added bonus of living on their 3 dogs. Will definitely come back here again if we're in the area. It was a wonderful stay! It’s our second visit to this lovely home. It’s highly recommended! The property is very clean and the owner is amazing! A warm and lovely atmosphere! Home is rented for 2019 and 2020 Commissioning Week.